Growing up, the term “tostada” in those big chain Mexican restaurants always referred to a Mexican salad served in a puffy fried tortilla the size of the Rose Bowl. It was basically a giant nacho chip topped with salad, and while my childish sensibilities may have thought this Americanized tostada was pretty cool, it’s quite far removed from the authentic Mexican tostada. Literally translated as “toasted,” the tostada consists of a single corn tortilla, fried until crispy, and then topped with meat and veggies. You don’t eat it with a fork – it’s street food that you eat with your hands, and when done right, it’s a fantastic treat. 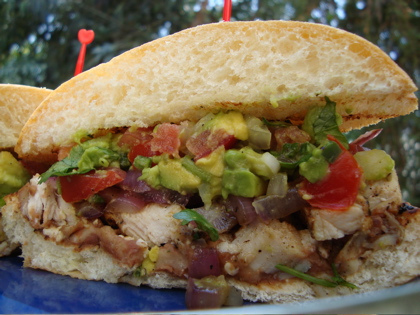 This recipe comes from television chef and restaurateur Aaron Sanchez’s book Simple Food, Big Flavor. If you’ve gotten tired of Rick Bayless’ recipes (not that you could), give Sanchez a try – he knows his stuff. 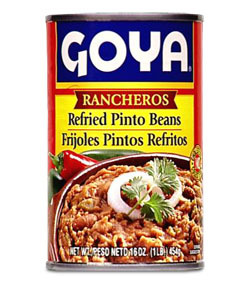 But for this recipe, I’d use either Bayless’ tomatillo salsa from scratch, or his Frontera brand bottled salsa. The great thing about tostadas is that like tacos, you can top with your favorite ingredients and alter the recipe to your own taste. The only changes I made to Sanchez’ recipe is that I added diced tomatoes and omitted the radishes and beans. 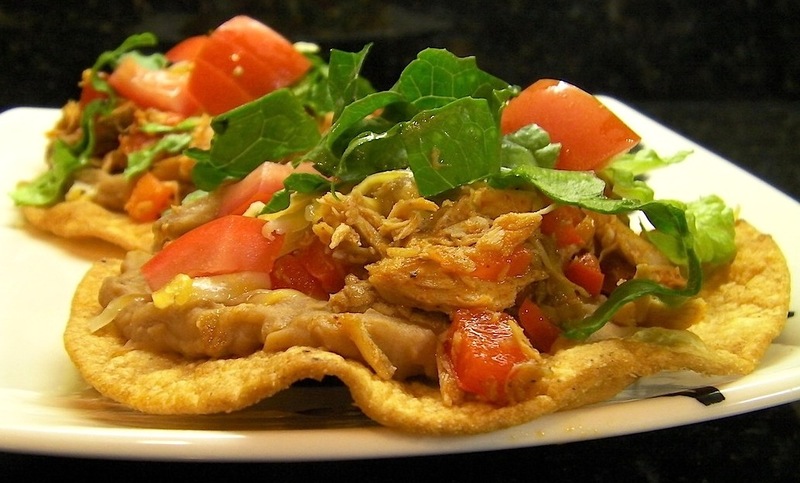 But again, the tostada is like a blank canvas for you to create a culinary masterpiece. Enjoy! Heat the salsa and chicken in a skillet over medium heat until warmed through. Reduce heat to low. Pour 1/4 inch of oil into a frying pan and heat on med-high. 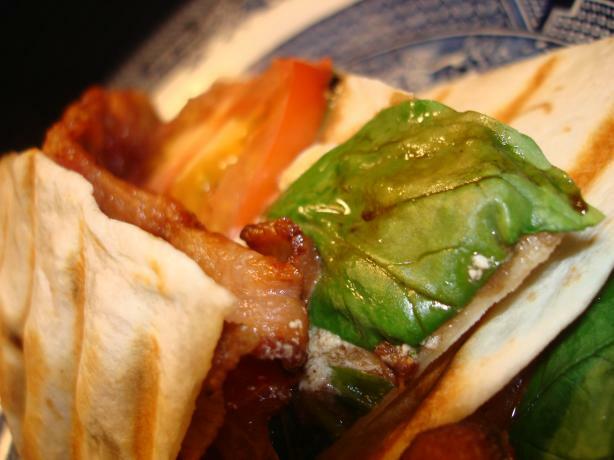 Fry one tortilla at a time until golden brown on both sides, about 30 seconds per side. Let drain on paper towels. Repeat with remaining tortillas. Spoon equal amounts of chicken mixture on each tortilla, then top with avocado slices, lettuce, and tomatoes. Sprinkle with cheese and drizzle crema on top, then add cilantro. Eat! 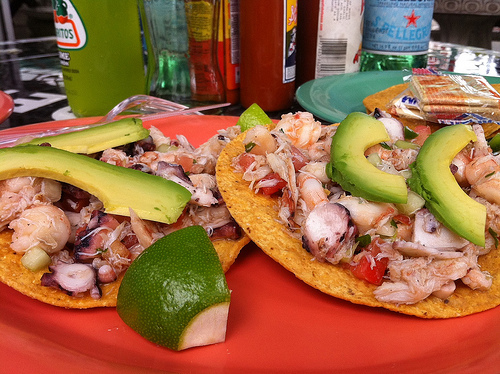 Dia de pesca literally means “day of fish,” but colloquially it means “gone fishing,” and for the most part, the seafood side of this little Mexican restaurant in San Jose is worth coming for. But many of the dishes we tried should have been a lot better; plus the whole experience would have been enhanced if Dia de Pesca had a liquor license. 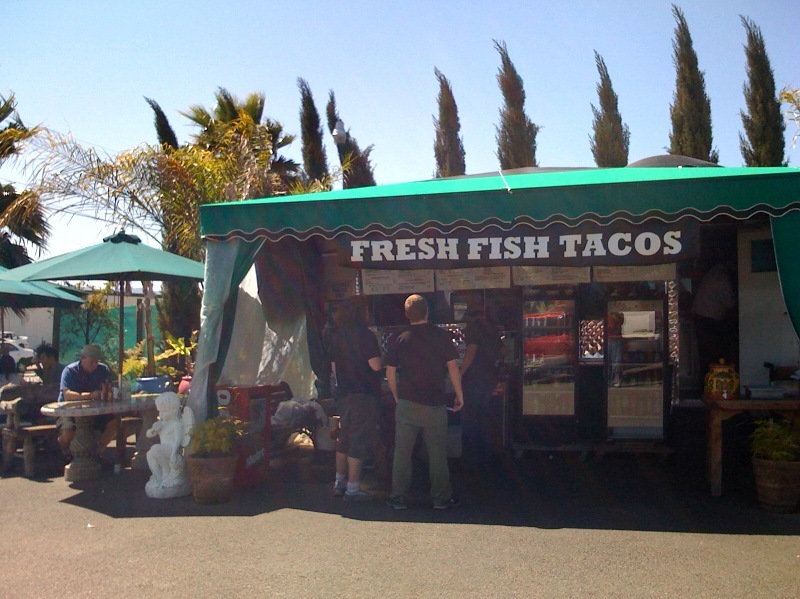 Located on Bascom Ave near Stevens Creek, Dia de Pesca looked very inviting as we drove into the small parking lot. A small trailer sat on one side, housing the kitchen, and several outdoor tables lined the way leading to the restaurant’s interior. It looked like the place to spend a warm lazy Saturday afternoon, dining on ceviche and tacos while downing margaritas and Coronas. But for some unfathomable reason, alcohol is not available at Dia de Pesca, much to its detriment, in our opinion. The menu is fairly extensive, ranging from seafood cocktails and ceviche to common Mexican fare like enchiladas, flautas, tacos, tamales, and burritos. As you might expect, the seafood choices are vast; most dishes can be made with tilapia, snapper, salmon, halibut, shrimp, tuna, octopus (or pulpo), scallops, and crab. Meat choices include beef, pork, and three different preparations of chicken. We began with the shrimp cocktail, a tilapia ceviche, and a ceviche with shrimp and octopus. The shrimp cocktail looked great, served in a tall ice cream sundae glass. But the dish was very disappointing – we were dying for some seasoning, be it salt, pepper, hot sauce, anything to keep it from just being cold shrimp in tomato juice. But unfortunately that’s all it amounted to. The ceviches were terrific – the lime juice that “cooked” the seafood was sharp but not overpowering, the pico de gallo was very fresh, and after adding a little hot sauce, the dishes came together nicely. For entrees we went with the enchiladas mojadas, the chile relleno with scallops, chicken flautas, and one pork tamale and one chile and cheese tamale. The enchiladas contained chicken wrapped in tortillas with sour cream, cheese, and a “zesty sauce.” All of us were taken by surprise at the taste of the sauce – it was more Italian than anything else, making the dish seem confused and just plain strange. It tasted fine, but it was not consistent with Mexican cooking at all. The chile relleno was quite good – a large green ancho chile was stuffed with cheese and lightly fried, then topped with scallops and salsa. Usually combining seafood with cheese is frowned upon, but it worked very well in this dish. The flautas were reminiscent of what you might see at an event being carried around by waitstaff – small fried tortillas rolled around chicken, topped with sour cream, guacamole and salsa. They were average at best. The tamales were disappointing as well – the masa was way too thick, particularly on the chile and cheese one; the cheese was barely warm instead of that lovely oozing quality it should have. The pork one was a little better, but both were topped with “mole de tamal,” which was little more than a red salsa and was fairly bland. Paring the menu down considerably would really help the cooks focus on quality instead of quantity. We would definitely return for the ceviche and would be willing to try some of the other dishes, but if Dia de Pesca really wants to cash in, getting a liquor license would do wonders. The Mouse House Kitchen gives Dia de Pesca 2.5 out of 5 stars. When the worst you can say about a restaurant is that its name doesn’t make much sense, then it’s doing pretty much everything else right. 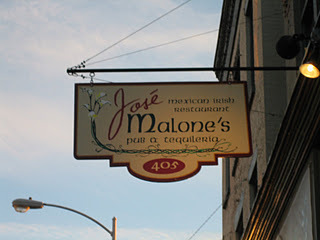 Jose Malone’s in Troy calls itself a “Mexican Irish restaurant,” but 99.9% of everything about the place is Mexican. Looking at the menu online before visiting, the dishes looked incredibly creative and delicious, so we were wary of setting our expectations too high (considering that we are in Upstate New York where quality Mexican food is hard to come by). Luckily, for the most part, our expectations were met with scrumptious zeal. The décor of the restaurant is bright, with the walls featuring Mexican-themed artwork and fabrics, brightly colored streamers, and the only discernable Irish item – a shamrock advertising Guinness beer. The space is somewhat small, but didn’t feel too cramped even with a good crowd last Saturday evening. The atmosphere was fun and not unbearably loud as we sidled up to the bar while we waited for our table. The drink menu features a wide variety of margaritas, from the classic to fruit flavors like black raspberry, pomegranate, and melon. They also have a pretty impressive selection of beers for a Mexican restaurant (maybe that’s the Irish influence), along with a decent wine list. We tried a classic margarita and a watermelon margarita. The web site advertises that their drinks are not “kiddie” drinks, and they are true to their word. These margaritas packed a nice punch, but were still very tasty. Once we sat down at our table and perused the menu, a drink was listed that was not on their separate drink menu – a watermelon habanero margarita. Naturally I had to order it, and it was one of the best drinks I’ve ever had. If for no other reason, a trip to Jose Malone’s is worth it just for this drink. The sweetness of the watermelon puree greets the tongue first, and then as the drink slides down the throat, the burn from the habanero coats the back of the mouth, but in the most pleasurable way possible. It was a perfect blend of sweet and heat – had I not been driving, I may have ordered two or three. Food-wise, things got off to a rocky start. While at the bar we ordered some house-made chips and salsa. The chips were pretty good and obviously homemade, but the salsa was a failure. It was very cold and fairly bland, and so it was with much skepticism that we decided on what else to eat. Jose Malone’s menu features a good number of small plates and appetizers, along with some standard Tex-Mex favorites and a variety of entrees. Their specials menu changes daily (do not go by what the web site says, as it seems they do not update that regularly) and is quite extensive, accounting for about 40% of the total food offerings. On this night, we eyed small plates like the 3 cheese and chicken chimichangas, the Oaxacan salad with grapefruit, cheese and veggies, the roasted corn chowder with bacon, and the bbq pulled pork nachos. We settled on the BLT quesadilla and the picadillo empanadas. The quesadilla was stuffed with bacon, pico de gallo, spinach, cheese, and a scallion-avocado relish, topped with a chipotle aoli. The flavors were delightful, and it tasted extremely fresh; there was no grease dripping out of the bottom, and the smoky aoli complimented the bitter spinach perfectly. It was a great dish, as were the empanadas. Seasoned ground beef, plantains, olives, tequila-soaked raisins and herbs made up the filling of the dish, surrounded by lightly fried dough. The filling was absolutely wonderful – the savory beef matched beautifully with the subtle sweetness of the plantains and raisins, creating a complex medley of flavors. It was served with a smoky tomato crema (a very thin sour cream) which was a great compliment, but the dish didn’t need it – it was fantastic on its own. Some of the entrée specials included a chile relleno, sesame salmon, stuffed pork chop, and a chile-rubbed ribeye steak. Their standard entrees include Memphis-style ribs, tinga poblano (traditional braised pork), chicken mole, and vegetarian and pork tamales. We opted for the blue corn-crusted catfish tacos and the roasted sweet potato, arugula and goat cheese enchilada. The tacos featured crispy catfish in a crunchy blue corn batter, topped with a cucumber slaw in a cumin-yogurt dressing and roasted piquillo pepper coulis. The flavors were vibrant and fresh – there was a little heat from the slaw and the dressing was a nice touch. The catfish was fried perfectly – crispy on the outside and very juicy on the inside. The enchilada was a little disappointing – it was mostly just sweet potato wrapped in a tortilla and covered with a green chile salsa. The arugula and goat cheese were nearly undetectable, which made for a fairly one-note dish. Both entrees were served with rice and black beans – you have the option of regular Mexican rice or their arroz amarillo (yellow rice) which has jalapeno, annatto and nutmeg flavors. It was slightly spicy and very delicious; a great substitute for the usual rice. We had no room for dessert, but next time we will save room, as their menu offers enticing homemade items like flan, apple empanadas and a banana chimichanga. Yes, there will be a next time, because their menu has so many intriguing items to choose from. With our enchiladas we had our choice of sauce other than the green chile, including their red chile salsa and their mole sauce. We got a side of the mole, and it was phenomenal – it didn’t necessarily compliment that particular dish all that well, but our taste buds are now hankering for the chicken mole. Prices at Jose Malone’s are reasonable, and the portions are generous but not overly so. Appetizers and small plates range from $6-$14, and entrees range from $10-$24 – a good value for the quantity and quality of the food. So don’t expect to “get your Irish up” at Jose Malone’s, but do expect the menu to live up to its promise of interesting and tasty dishes. The Mouse House Kitchen gives Jose Malone’s 3.5 out of 5 stars!